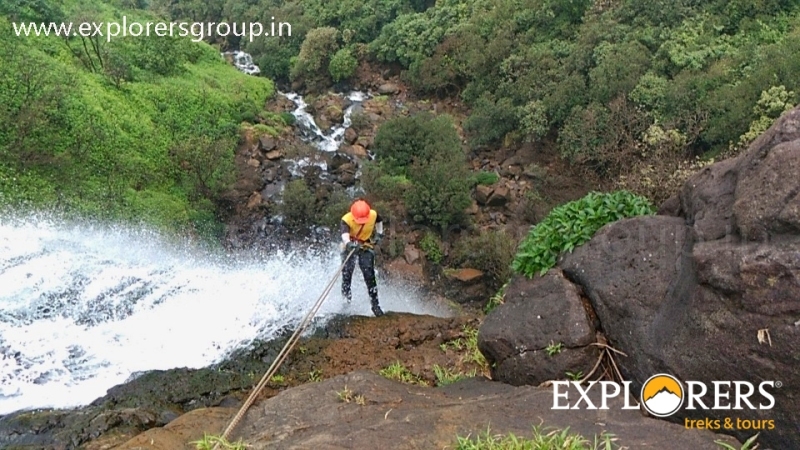 As per the Tradition of Explorers we are happy to announce Madhe Ghat Waterfall Rappelling. 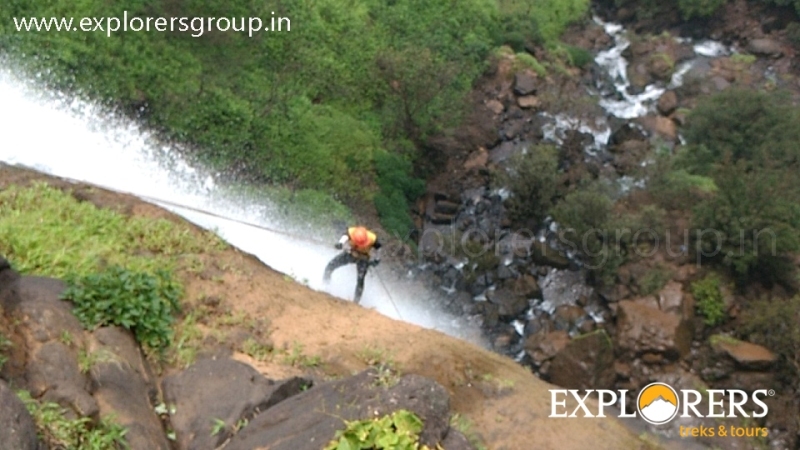 Madhe ghat Waterfall Rappelling is very good for adventure freaks. You have to take a Little walk of 30 Minutes to Reach Waterfall. Getting down around 150 feet through a gushing waterfall is a really stunning experience… Rappelling is the controlled descent down a rock face using a rope. Madhe Trek gives immense pleasure of trekking in monsoon season. In recent years this route becomes more popular for enthusiastic trekkers. Madhe Ghat is located around 65 km south west of Pune bordering Raigad district and in the vicinity of Torna, Rajgad, Raigad and backwaters of Bhatghar dam. In history, when the great warrior Narveer Tanaji Malusare died in the Sinhagad battle, his body was to be taken for last rites in his native village Umrath near Poladpur. Tanaji Malusare’s funeral procession was taken to his native place from this Madhe ghat route. 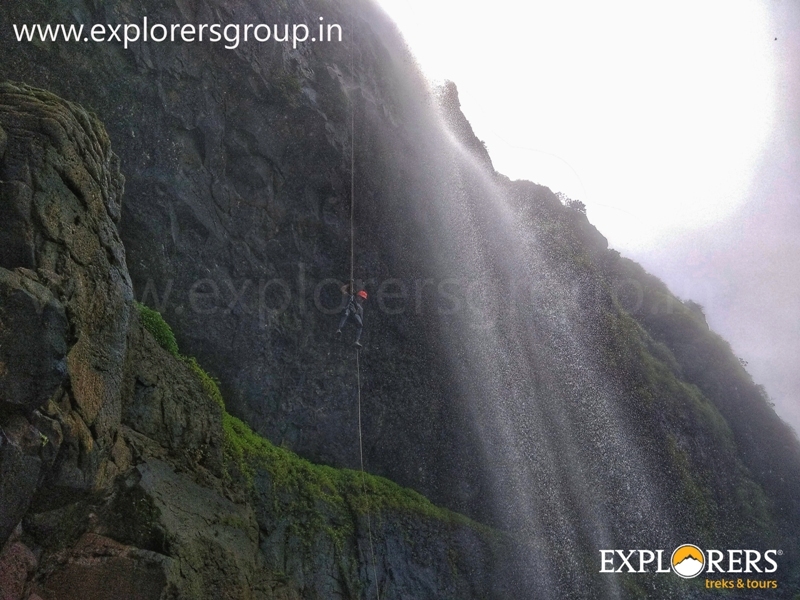 Join us for Madhe Ghat Waterfall Rappelling, One Full Day of Mind Blowing Adventure Rush!!!!!!!!!!!!!!!! 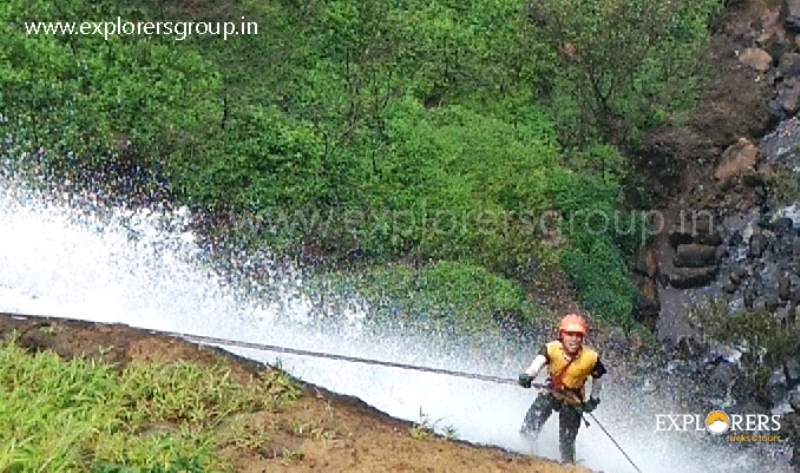 Please Call for availablility before you book Madhe Ghat Waterfall Rappelling, to avoid 5% Transaction Charges. 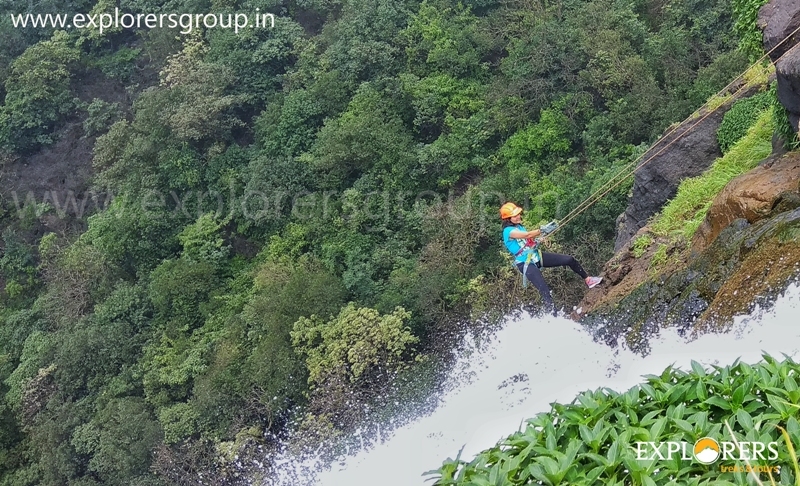 Last date of Enrollment for Madhe Ghat Waterfall Rappelling: Three days before the day of departure or till seats left. Departure Date & Time for Madhe Ghat Waterfall Rappelling: On the day of Event by sharp 06.00 am from SP College, Tilak Road. Arrival Date & Time for Madhe Ghat Waterfall Rappelling: On the day of Event around 08.00 pm at SP College, Tilak Road. Reporting Time & Place for Madhe Ghat Waterfall Rappelling: On the day of Event by Sharp 05.30 am at SP College, Tilak Road. Mode of Transport for Madhe Ghat Waterfall Rappelling: Pune – Kelad – Pune by Private Non AC High back Bus. Batch Limit for Madhe Ghat Waterfall Rappelling: 25 Participants. Route for Madhe Ghat Waterfall Rappelling: Pune – Via Singhgad Road – Velha – Kelad Ghat – Madhe Ghat & return via same route. Two Wheeler Parking for Madhe Ghat Waterfall Rappelling: We will provide parking space at our office premises at owner’s risk. Give attendance to Team Explorers. After Attendance Departure towards Madhe ghat. Reach Madhe Ghat. 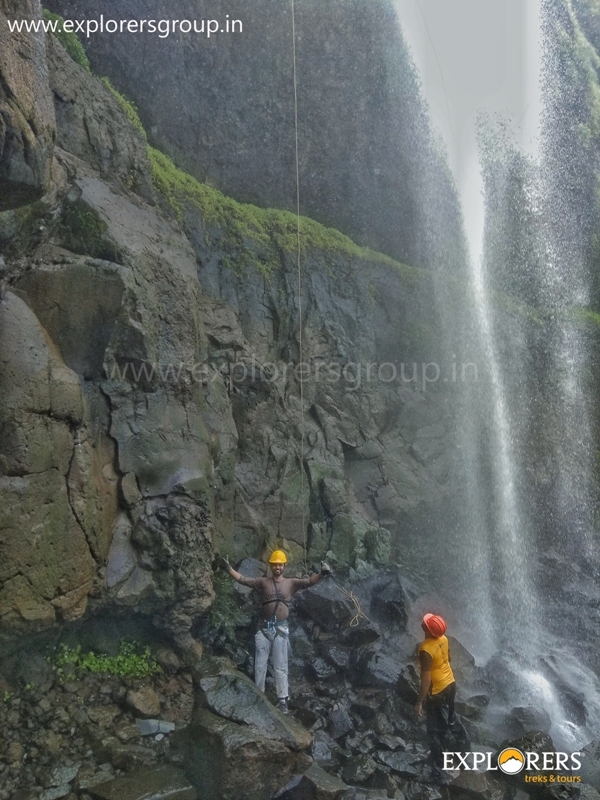 After Introduction & Briefing about the Activity & equipments, immediately start Madhe Ghat Waterfall Rappelling under the guidance of Team Explorers. Activity ends with Happy Memories. Reach Pune via same route with Happy Memories. Transport by Non AC High Back Private Vehicle (Pune – Madhe ghat – Pune). Waterfall Rappelling with all safety Gears.